You can ask why penguins do not suffer from caisson disease? also called BENDS, or CAISSON DISEASE, physiological effects of the formation of gas bubbles in the body because of rapid transition from a high-pressure environment to one of lower pressure. At atmospheric pressure the body tissues contain, in solution, small amounts of the gases that are present in the air. Underwater divers breathing compressed air are faced with the possibility of a form of decompression sickness known as the bends. As they descend into the water, the external pressure increases proportionally to the depth. The compressed air that is breathed is equal in pressure to that of the surrounding water. The longer a diver stays down and the deeper the dive, the more compressed gas that is absorbed by the body. When the diver ascends, time must be allowed for the additional gases to be expelled slowly or they will form bubbles in the tissues. The major component of air that causes decompression maladies is nitrogen. The oxygen breathed is used up by the cells of the body and the waste product carbon dioxide is continuously exhaled. Nitrogen, on the other hand, merely accumulates in the body until the tissue becomes saturated at the ambient pressure. When the pressure decreases, the excess nitrogen is released." 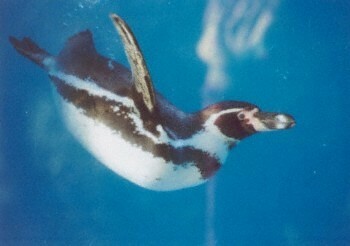 Penguins don't have gills like fish, but lungs and have to surface regularly for breathing. But their lungs are not filled with oxygen in the same way as ours. In human lungs the tubules lead to minute air sacs, called alveoli and through the rigid chest blood is pressed in our lungs to compensate the large pressure of the water. In penguins these tubules lead to an ingenious system of air sacs, on both side of the lungs, (see also Anatomy in animated gifs) which don't resist the pressure but become compressed. The air, inhaled before diving, is in those air sacs, and not in the lungs. So there is not too much air in the lungs and no bubbles (with nitrogen from the air) will be formed under the increasing water pressure. These bubbles lead to the decompression disease by divers. The higher the pressure, the more bubbles with nitrogen. Penguins (and other diving animals too) have evolved a lot of adaptations to spare oxygen under water. Their heartbeat slows down, the pulse decreases and their muscles become less blood. Only the most important organs, like brain, heart and lungs, are supported with oxygen. The oxygen, necessary for the locomotion, is delivered by the muscles themselves. The complete physiology of diving is still unknown, but certain is that the energy consumption in the water is lower than on land and the oxygen, stored in the air sacs, is only a emergency ration, e.g. when they can't surface through the ice.